having or showing mental or moral strength to face danger, fear, or difficulty : having or showing courage. Fear is mentioned in both definitions, but nowhere does it say that being brave or showing courage means the opposite of feeling fear. Rather these words represent the ‘strength to face and withstand fear’. I think bravery and courage are rather misunderstood then, because without them we are always going to look for the opposite of fear instead of thriving alongside it. Before I created the art project containing the words, ‘be brave it is going to be good’, I had another mantra. ‘Feel the fear and do it anyway’. This is the title of a self-help book written by Susan Jeffers, finally published in 1987. Susan shopped it around quite a bit and not surprisingly, the male dominated publishers did not want to publish the title. It has gone on to become a classic in the genre, helping millions upon millions of people. Yet, it seems like the message is being forgotten somehow. I know for myself, it seems like more fun to chant about being brave. Who wants to tackle fear? It is quite a monster, really. But the very essence of bravery is intertwined with fear. Somehow it seems more fashionable to use words like brave or courage, as if the mere mention of the word fear somehow brings it into being. Like not saying Voldemort but rather, he-who-must-not-be-named. I continue to dance around fear, giving it a wide berth. My compassion and understanding of my fear needs more practice. I know this to be true. For I can still get a surge of adrenaline and feel the cortisone rushing through the veins of my body, leaving a sick feeling in the pit of my stomach. But, it is way better than it used to be. These days, when I feel fear rising it is due to a reasonable danger or sense of worry looming. My kids being attended to by a doctor in Bali, one of them needing an IV drip, that left me with that horrible feeling of dread. That feeling persisted until they were both showing signs of becoming well again. That is a reasonable use of fear, I think. Having that feeling because of worry that your boss is going to fire you or give you a massive chewing out for something going on at work, that is fear running amok. Fear keep us alert to danger. Fear helps us run from danger. A healthy sense of fear can keep us alive and well. In contrast, the unhealthy build up of fear is making us sick. Modern life is causing us to feel fear at the wrong times. So much so, that we don’t feel fear appropriately. Which is no surprise. After all, if normal life creates a whole lot of fear, the fight for survival will force us into trying to minimize fear at every turn. In this kind of situation the thought of trying to be brave is laughable. Yet, there is a cost to not being brave. By not digging down and mustering up the courage. Just as we need the correct balance of fear, by embracing that fact and walking with fear, bravery and courage have a chance. Margie Warrell, an international keynote speaker, bestselling author & women’s leadership advocate, urges women to think about the cost of not being courageous. Unfortunately our brains are wired to discount the cost of inaction, to overestimate the probability of things going wrong and to underestimate ourselves. But here is what makes being brave so hard: Bravery needs to be conquered every single day. It’s not a medal that you win and you pin to your suit’s lapel, and from then on colors everything you do. It’s a conscious effort to overcome your self-doubt, your lackluster commitment, and your hurt feelings on a daily basis. Wow, that puts it into perspective, doesn’t it. You are not brave once, like the bear in The Wizard Of Oz and then everything is fine. You have to be brave and act brave, again and again. One single brave action is not going to save the day, like in a fairy tale. It will be the culmination of a lifetime of bravery, of feeling the fear and doing it anyway. Brené wrote a whole book under the title of the last 2 words from this speech – Daring Greatly. This important work has informed and inspired so many, myself included. As a researcher who has interviewed countless people to find the patterns in their lived experience, the material she provides belongs to all of us. It is our shared humanity and our capacity to be courageous, brave, and most importantly vulnerable. We know the truth when we hear it because it resonates somewhere deep inside of us, in our souls. Again, all fine and well but how do we reframe the natural tendency or our brains? Brené writes words she needs to have with her, on a little slip of paper and tucks them into her pocket. She is able to tough them and that brings her strength during tough parts of her day. The words are totem of sorts, easy to recreate at a whim. 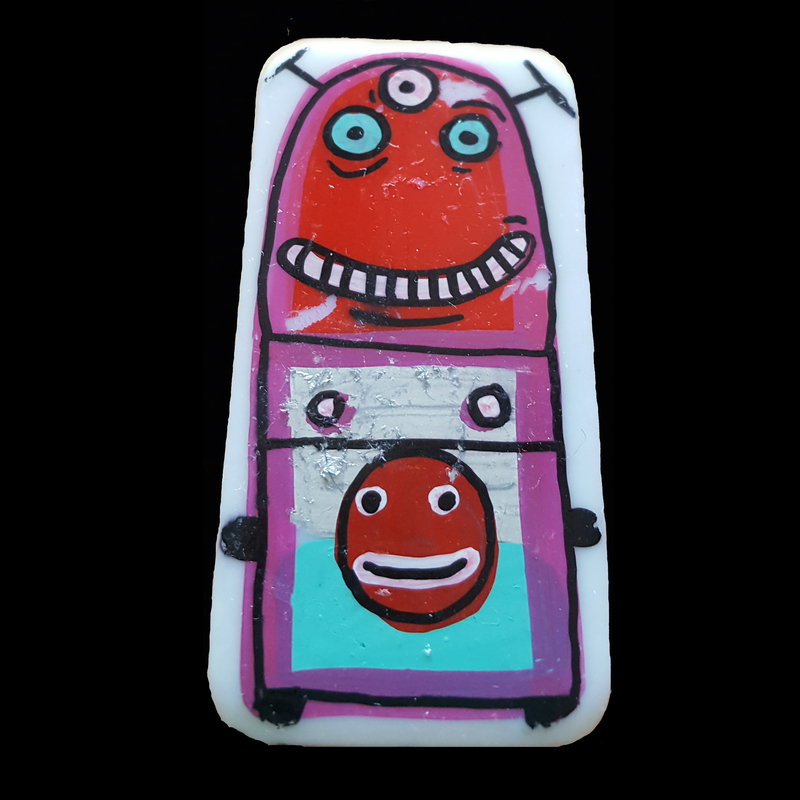 Gary Hirsch created Brave Bots, small totemic, art objects painted on the back of dominos. The idea is to go through your entire day visualizing that you have a personal giant robot that protects, defends and gives you outrageous compliments. My aunts brave bot had gone on a walkabout. She recently sent me an email with this photo – her brave bot had come home! It doesn’t matter how we practice being brave. It only matters that we do. Dig down, understand that there will be vulnerability required, but do it anyway. Whatever ‘it’ is for you. This feeling and practice will be required many times a day, maybe even within an hour, depending on what is going on. The only important thing to remember is to keep going.